As previously reported, at times it only takes a few people coming out and confronting Immigration Enforcement to get them to leave. These acts of personal courage build on previous actions by other people – from Southall to East Street, to Peckham and Shadwell. Anecdotally, we know of other cases of more low key, but no less important, resistance. 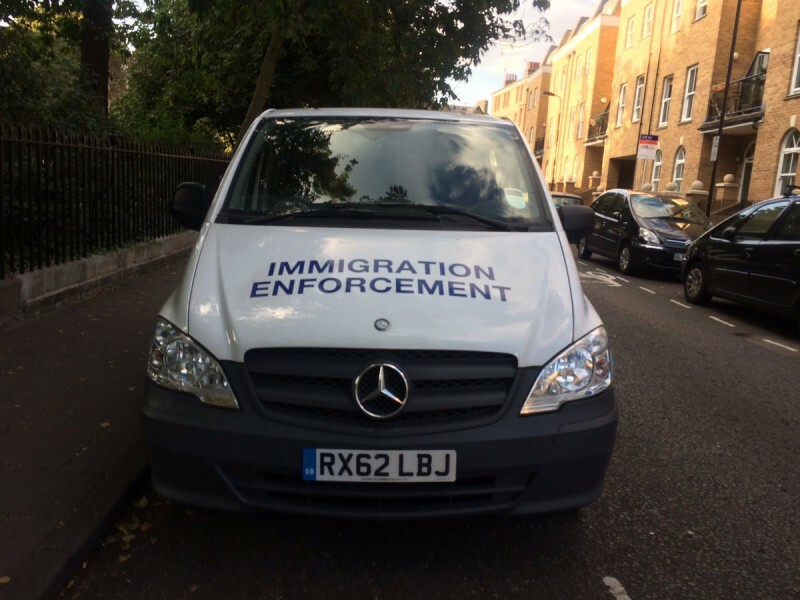 We cannot know about every incident of refusal or rebellion to the Home Office bullies, or the identities of those involved, but we can be sure that every act of defiance adds to the last – and that in our collectivity we can keep the ‘racist van’ and its officers at bay. This is the first in a series of personal accounts of people who’ve stood up to the officers. We think it’s important that people share their stories, to give courage and solidarity to others, and to show that you don’t need to be an ‘Activist’, a legal eagle, or a big tough guy to stand up to them. If you confront a raid and would like to share your story, please write a short account and we will publish it anonymously (unless otherwise stated). I saw them parked on Clapton square on a Tuesday afternoon, two vans. It was the first time I’d seen them in my immediate area. The first had two people in the front and another in the back, and a big dent under the back wheel arch. The second had two people in the front and nobody in the back. I stopped my bike right in front of them to take pictures of the vans and tweet them with the location to anti raids network. A second later they started up their engines and drove off. The passenger in the first van smiled and waved goodbye at me, so I waved back. They turned round the corner and I followed them, had to wait awkwardly in a layby while they waited at the lights. When we got round the corner they passed, so I sped up to catch them at the next lights. When they stopped, the passenger in the front car shouted out “Hi Mary!” in a sing song tone of voice, so I cycled over. I had no idea what to say so I just waited while the one in the passenger seat rolled down her window. After a tiny pause she said “Don’t you have better things to do with your evening than follow people around?” I said no, I didn’t really. Then I said “I wish you didn’t do the job you do, it makes me sad. And you’re ruining families.” They smiled and didn’t say anything. Then I asked how they knew my name, and they said from the tweet I’d sent. The one in the passenger seat held up her phone and smiled. I said “I’m glad you’re keeping up with modern technology if not with modern times.” Because I didn’t know what else to say. They scoffed. I was too angry to follow them safely so I cycled off. The officers in the second van watched closely as I cycled away. This account suggests that officers are now so worried when someone challenges them that they are checking social media for alerts. Keep up the pressure!